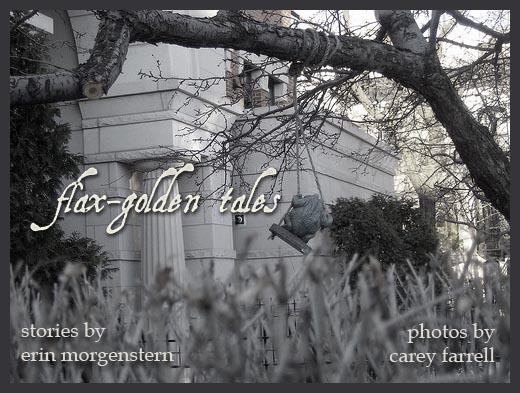 Each flax-golden tale consists of a photograph by Carey Farrell accompanied by an original ten-sentence short story by Erin Morgenstern. They were posted to erinmorgenstern.com on Fridays from July 2009 to July 2014. There are 261 tales. All flax-golden stories can currently be read here. Erin Morgenstern is the storyteller, weaving little bits of word whimsy and sending them off into the wilds of the internet with photographs to keep them company. She also writes novel-shaped tales, paints pictures, collects cocktail recipes, knits at a mediocre level and burns easily.